Opera TV announced today a partnership with Claro video, a premium video on-demand service, to bring its service to millions of devices through participation in Opera TV’s Certification Program and distribution through the Opera TV Store. 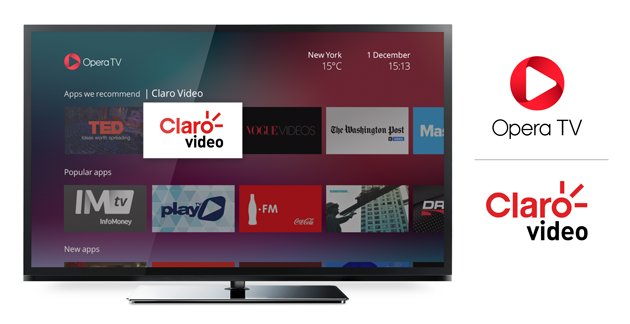 Through this strategic partnership with Opera TV, Claro video will dramatically increase its presence in the growing Latin American market by streamlining its app development and deployment efforts, making it available on a variety of ecosystems and devices where over-the-top (OTT) is enabled by Opera TV. By partnering with Opera TV, Claro video will quickly and easily deploy the app in the Opera TV Store, making it available to millions of consumers across multiple regions, devices and ecosystems without needing to work with each device manufacturer and ecosystem individually. This will enable Claro video to speed up time-to-market and begin distributing content to consumers more quickly in the 16 countries of LATAM where the service will be available. The Opera TV ecosystem is the world’s largest unified platform for connected TV devices spanning more than 40 million devices shipped each year. The Opera TV Store, an OTT experience for consumers, brings more than 1,000 apps to major OEM brands and pay-TV operators. The Opera TV Certification Program unites HTML5-based devices into one coherent ecosystem that is market-ready at the silicon level, making it easier to bring (OTT) services to multiple platform and device ecosystems. It provides app developers with unprecedented access to specifications and documentation for connected TV platforms, simple-to-use developer tools such as emulators and code snippets, and access to a global support team of experts. Unlike individual OEM or operator platforms, the Opera TV platform evolves quickly to keep pace with market requirements, supporting the complex needs of demanding OTT services. Certified apps are distributed through Opera TV partners, which include consumer electronic device manufacturers as well as the fast-growing pay-TV and free-to-air operators. Unlike other programs, this is a multi-silicon, multi-device, multi-industry approach, all aimed at reaching viewers in their living rooms on any device. Juliana Psaros, who is driving Opera TV’s content acquisition efforts in Latin America, will participate in a panel titled “The Revolution of Connected TV Business?” taking place Thursday, November 3 at 16:15 at the NextTV CEO Latin America Summit in Miami. For a full list of certified applications, please contact the Opera TV team. For more information on the Opera TV Certification Program, or to start the process, please visit http://www.operasoftware.com/campaign/certification-program. Opera TV is the market leader in enabling the TV industry’s transition to OTT. The Opera TV portfolio powers rich web experiences on tens of millions of Smart TVs, set-top boxes, Blu-ray Disc players and chipsets for more than 60 customers. The Opera TV ecosystem spans the Opera TV Store app platform with hundreds of entertaining apps tailor-made for TV, the Opera Devices SDK (software development kit) for creating and rendering HTML5-based user interfaces, and the Opera TV browser for reaching the full web. Opera TV offers solutions for OEMs, pay-TV operators, broadcasters and content publishers. Visit www.opera.com/tv to learn more. Claro video is the leading service in Latin America of VOD (Video On Demand) via streaming, which provides its audiences immediate access to the most complete and attractive offer of content on the market. It offers consumers thousands of movies, series and concerts, and provides access to newly-released movies for Transactional Video on Demand just a few weeks after they premiere in theaters. This combination of models – subscription and transaction on the same platform – is an important differentiator for Claro video in relation to other video streaming services. Claro video is operated by Claro video, Inc., affiliate company of America Movil, S.A.B. de C.V. Claro video is available in several countries in Latin America including Mexico, Argentina, Brazil, Uruguay, Chile, Colombia, Peru, Ecuador, Guatemala, Nicaragua, Honduras, Costa Rica, El Salvador, Panama, Paraguay and the Dominican Republic. To learn about Claro video, please visit www.clarovideo.com.